The Baltimore Oriole, Icterus galbula, got its name because the male's colors resemble those on the coat of arms of Lord Baltimore. The American League baseball club, the Baltimore Orioles (of Baltimore, Maryland), were named after this bird. This is the state bird of Maryland. The Baltimore Oriole is a small icterid blackbird, 18 cm long and weighing 34 g.
Adults have a pointed bill and white bars on the wings. The adult male is orange on the underparts, shoulder patch and rump with black everywhere else. The adult female is yellow-brown on the upper parts with darker wings, dull orange on the breast and belly. Their breeding habitat is the edges of deciduous and mixed woods across eastern North America. The range of this bird overlaps with that of the similar Bullock's Oriole in the midwest, and the two forms are sometimes considered to be conspecific (of, or belonging to, the same species) under the name Northern Oriole because they form fertile hybrids. The nest is a tightly woven pouch located on the end of a branch, hanging down on the underside. The Baltimore Oriole is a rare vagrant to western Europe, and there are a couple of British records of birds wintering near garden feeders, including one in Oxford in December 2003. Perhaps the most remarkable record was one on 7th-8 October 2001, which was very appropriately found in Baltimore, Co. Cork, Ireland, the first record of the species in Ireland. These birds forage in trees and shrubs, also making short flights to catch insects. They mainly eat insects, berries and nectar, and are often seen sipping at hummingbird feeders. 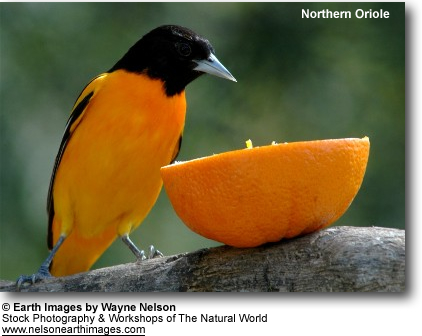 Oriole feeders contain essentially the same food as hummingbird feeders, but are designed for orioles, and are orange instead of red and have larger perches. The birds are also fond of halved oranges. 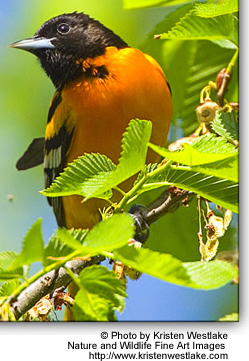 The male sings a loud fluty whistle that is often heard before this oriole is seen.